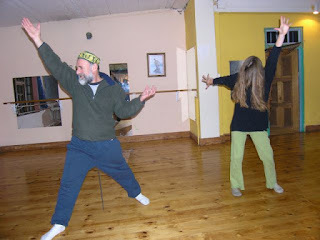 After the eclipse, Julian and Julia - cranio sacral therapist and belly dance teacher, as well as being a great woman - and I had one of our discussion and dance sessions. We do these every two weeks. The discussions center around the theme of quantum effect, sometime in great depth, ranging from stuff like how photons of light move and their characteristics. We talk about the different energies and frequencies that hold us together. We have covered the types of forces in these nano-spaces. The effects of curved space, light, and crystalline structures, etc. During these session, we often draw pictures of these topics and how we view them. In the final stage, we dance/move the sense of what has arisen for us. We seek to find the expressions in our waters so to speak. This night we were working with the notion of what it is to measure in the quantum arena (what the physicists would call quantum entanglement). During this discussion, one of our favourite topics, the notachord, arose again. The notachord is an incredible event in the beginning of life in the womb when the cells begin to "spontaneously", as it were, assemble. Another favourite is investigating the equations of the 4th dimension - how that looks to our 3 dimensional minds. Finally we arrived at chaos in conjunction with cosmic measurement, and were ready to dance. When it came time to move, we decided to work with a chosen space in our lives at that moment. We had determined that each one of us would move authentically, and then each have a turn to move through it in front of the others who in turn would enact and then comment on what they saw. I decided to map out my mandevilla journey as I knew the path in my bones. Thus I was able to watch my journey unfold interpreted in front of me, as they had and still have, no idea what they were enacting. They were good! They never missed a step. After, their comments were that there was something feline in the dance. They could feel it in the movements and the fingers which sensed around like whiskers. I saw them go down the vortex and come up. They dance their way through the mountain easily recognising it as such.